Grace Black Beauty Salon 1005 Edgmont Ave. Grace Black ? - 1952 - ? 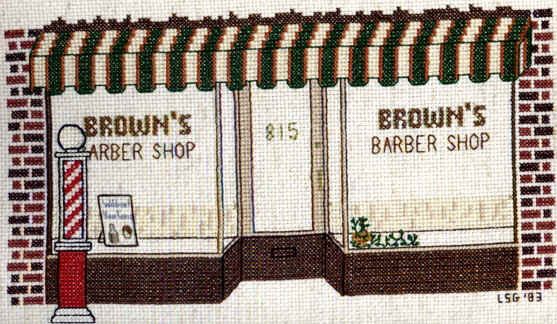 Jacob Bowers 3rd & Kerlin St.
Brownie's Barber Shop 8th St. near Welsh, opposite the Boyd Theatre ? - 1952 - ? Brown's Barber Shop 815 Morton Ave Cliff Brown 1935 - 1972 "My Father in Law, Cliff Brown, operated his Barbershop from 1935 to 1972. As a kid from Rose St. we all went to Mr. Brown in the summer for a "flat-top" .He gave the best in the city." "Bufano's Barber Shop was owned & operated by my Grandfather Alfred Bufano who employed his brother, Andrew. This barber shop was located at 17th & Providence." 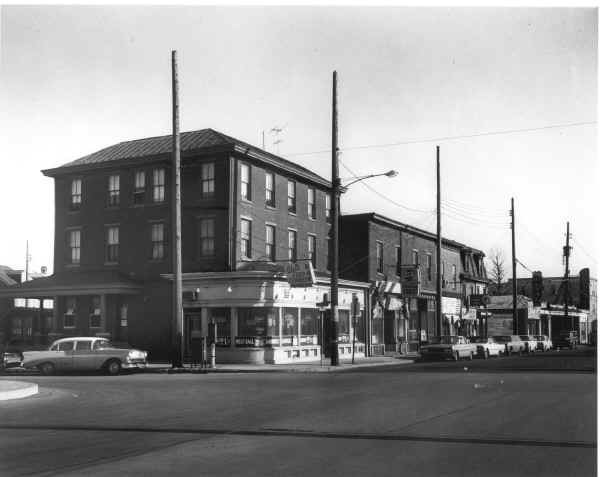 "Andy & Al Bufano's Barber Shop was located on the corner of 17th & Providence next door to the Providence Avenue Methodist Church for 60 years. Urban Renewal caused it to relocate." and Andy's daughter, Rita Culbertson. Charlie's Barber Shop In the alley in Highland Gardens "There was a barber shop next to McGlone's Market in the alley in Highland Gardens called "Charlie's". I remember because as kids we called it "Chop Chop Charlie's"
Michael Laganilla "My father and uncle had a barber shop across from the police station. His name was Marino DeSantis, and my uncle was Michael Laganilla. My Mother also had an Italian restaurant called Bellines, not sure of spelling or location. We use to live across the street from a store I believe the name was Fusco not sure of spelling again. That was about 1946,47. My cousin was a police officer, Sam Laganilla. My father was a member of the Abruzzi Club. worked with Joe Bondresky c. 1940 - 1970's Joe Olnick, owner, retired 1973. Joe Bondresky continued for several more years. Thanks to JLMAGLIO@aol.com for this information. Tony Landino 1920's - 1969 "Landino's Barber shop was first called: Landino Bros. barbershop. It was started by Joe Landino in the 1920's and then taken over by Tony Landino in 1933 in partnership with his brother Louie Landino. Tony kept the name Landino Bros. barbershop from the late 1930's when he took over full ownership of the business and he kept the shop at 7th and Concord till 1969 when he moved it to Brookhaven." Jack Lippolis 18th & Edgmont Ave. Jack Lippolis "Jack Lippolis had a shop at 18th & Edgemont. The long narrow 3 story building is still there. He moved to Milmont Park in the fifties. Next to it was a ice house where the kids would gather on a hot day to garb the chips of ice from blocks being separated." Little Joe's Barber Shop 22nd & Edgmont Ave. ? - 1965 - ? Lou-San Beauty Salon 620 Sproul St. Louis Colamenco & wife Lee, managers 1952 ? - 1952 - 1965 - ? Mazza's Beauty Shop 307 W 3rd St. "For any old timers; grocery store at 3rd & Franklin was run in 1948 by Mr. & Mrs. Forchetti; very nice people. My wife and I lived in the third floor apartment above Mazza's beauty shop at 307 W. 3rd. When last seen house was deserted and vacant." Nick the Barber, aka "Quick Nick" 10th & Keystone Rd., Buckman Village Nicholas Polinchak Late 1950's - 1970's "Quick Nick was an avid member of the John Birch Society. At this location from the late 50's until Nick took ill in the mid 70's"
"Nick used to give me a nickel for sitting still in the chair and I think a haircut was .25 back then." Pompilii / Pompilli 3rd & Broomall St. Sylvester Pompilii / Pompilli c. 1927 - 1942 Sylvester Pompilii / Pompilli became a Chester police officer on Feb. 15, 1943. Rettira@aol.com Cooper Jesse Prescott's Barber Shop 3rd & Jeffrey St. Cooper Jesse Prescott ? - 1930's - ? William Ryan 2727 W 3rd St. ? - 1902 - ? (Sister of Ollie Strand) "The family lived in the house and My aunt shop was in the back. I remember standing with my Aunt and Uncle back in 1967 and seeing all the women come to get their hair done by my Aunt. It was a real pleasant atmosphere. And she also had a sister that was a beautician and her name is Ollie Strand and her shop was located between 2nd and 3rd on Lloyd Street." Mrs. Terrell 9th St. near Upland or Madison "I just remembered the first perm I ever had and it was given to me by a Mrs. Terrell in her hair dress parlor. It was on 9th.st., around Upland or Madison sts. My grandmother always went there. There was this huge thing hanging from the ceiling with all these wires and clips hanging there. Can't you imagine.I was about 5 or 6"
Vic's Barber Shop 21st & Edgmont Ave. "I and my family got our hair cut at Vic's Barber Shop at 21st & Edgemont Avenue across from Zeitz's Pharmacy all during the 50's and 60's. Vic would cut your hair for 35 cents and apologized for months when he raised the cost to 50 cents. He had 2 other barbers who worked for him. Vic spoke in broken English. No matter how you told him to cut your hair it always looked the same." Andy Zachorchemny's Barber Shop 705 McIlvaine St. Andy Zachorchemny 1940's Thanks to JLMAGLIO@aol.com for this information. (Click on the thumbnail to see the full-size picture.) Joe Ciesielski's Barber Shop 2nd & Thurlow, SW corner Joe Ciesielski Late 1930's (?) until early 1980's Jack Chambers remember a barber shop at this location - can anyone else help with the name? Niece, Stella J. Brown has come through with the identity of this shop! She also adds: "Before that, his parents, who came from Poland around the turn of the century (my grandparents), had an ice cream store (cones, shakes, etc.) at that location. They operated it probably in the teens thru the 1920's or early 30's before my uncle made it into a barber shop. I know I have a picture of the ice cream store. My mother, (Joe's sister) often spoke of the store. In fact I have an ice cream scooper from it that my mother (now deceased) had saved after all those years ago." Ed's (?) Barber Shop Highland Ave. between 3rd & 4th, NW corner of alley Jack Chambers remembers a barber shop at this location - can anyone else help with the name? David J. Hentosh says he believes the name was "Ed's Barber Shop". � 2000, 2001, 2002, 2003, 2005, 2006 John A. Bullock III.